If you purchase Topps Now Baseball cards, you are eligible for the new 2017 Topps Now Baseball Loyalty Program membership promotion. 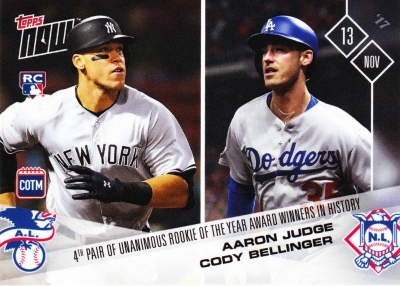 The 2017 Topps Now Baseball Loyalty Program includes an invitation-only Platinum level along with three primary tiers available to everyone: Rookie, All-Star and Hall of Fame. 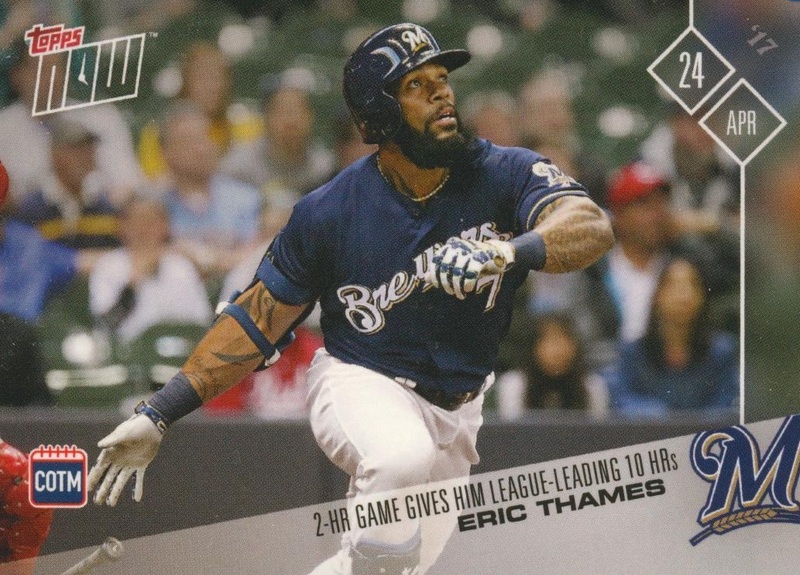 This membership is largely built around the 2016 and 2017 Topps Now Baseball sets. Starting off, the three main levels are decided by the amount you spend with each $1 being worth a set number of points. Rookies earn one point per dollar while All-Stars get two points and Hall of Fame members total four points. More points can be earned by actions like referrals or social media interactions. This is not just for 2017 purchases, as collectors can qualify based on 2016 purchases. If this is the case, you can either pick the coupon OR cards based on your level. 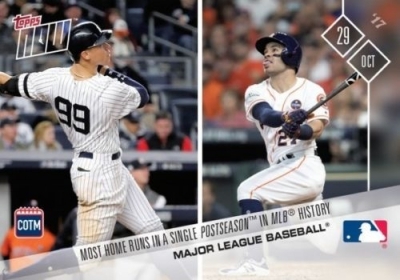 Additional facts and answers are found at the Topps Now Baseball Loyalty Program page. 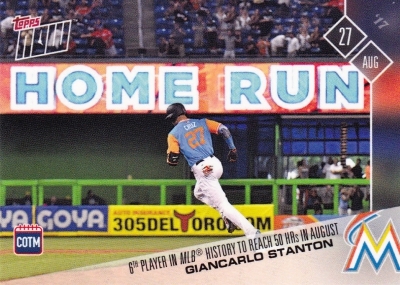 While Rookies only earn points, which are themselves redeemable for coupons (at a rate of 500 points = $5 discount), the additional payoff for All-Star and Hall of Fame members comes with free "Card of the Month" cards and more coupons. All-Stars get a $5 coupon and one Card of the Month (COTM) while the Hall of Fame folks receive a $20 coupon and Card of the Month editions for the rest of the year. These COTM releases, which started with April, have proven to be fairly rare with the first two months under 200 copies, and subsequent releases under 500 copies. 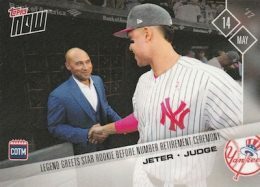 Most notable is the May combo for Derek Jeter and Aaron Judge, which is limited to just 198 cards. Moving to the big spenders, there is an ultra-exclusive membership, as well. 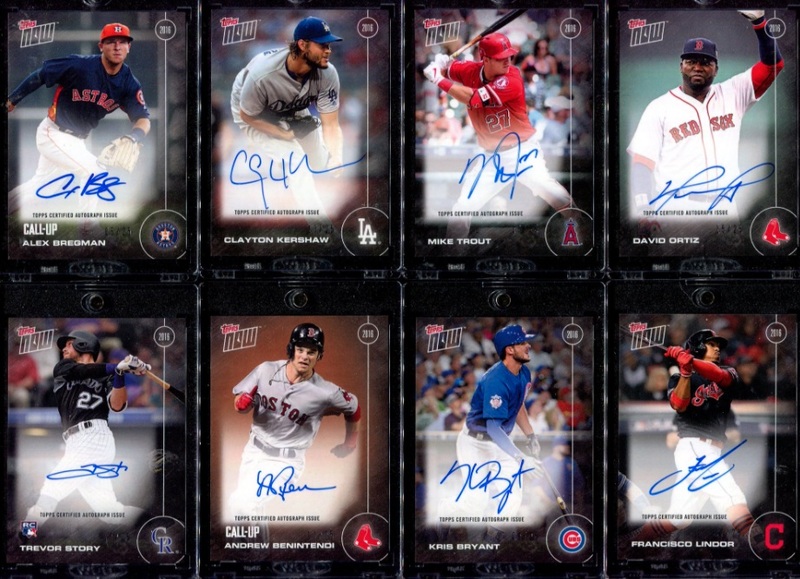 For Platinum members, the 2017 Topps Now Baseball Loyalty Program letter of notification comes with an enclosed nine-card autograph set covering top players from 2016 Topps Now Baseball, each numbered to 25 copies. 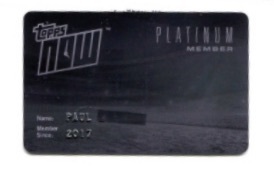 There is also a special Topps Now Platinum Member card in black. 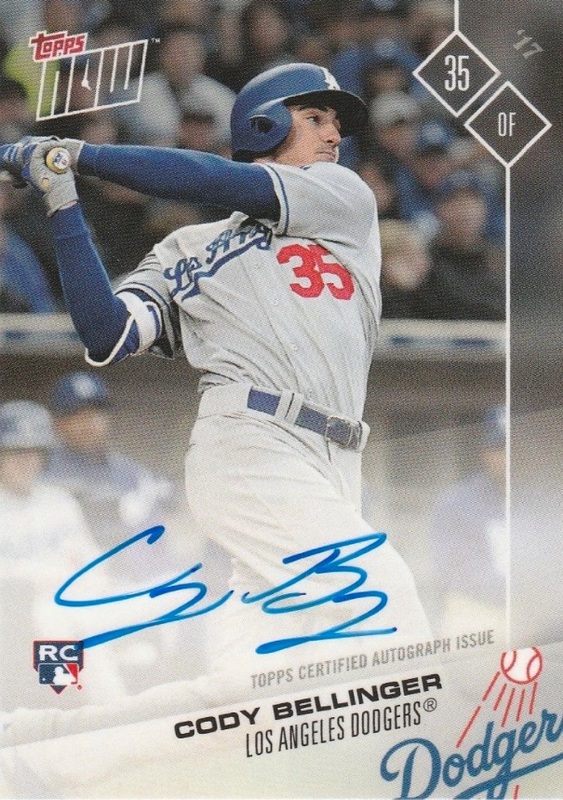 Platinum members were again treated to freebies from Topps at the special All-Star weekend party that included a set of autographs, including Cody Bellinger, as well as SSP "Topps Now Platinum Member" stamped versions of the All-Star Game sets. 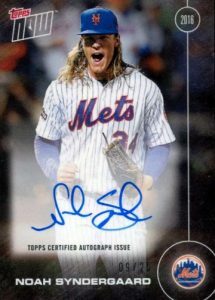 Future 2017 Topps Now Baseball Loyalty Program rewards include the promise of other autographs and access to a similar signed set for the 2017 season that is to be issued at the end of the year. 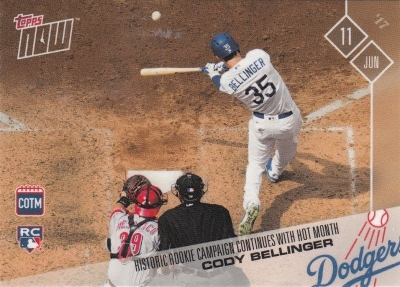 It also includes the Card of the Month cards for the rest of the season. In addition, Platinum members receive 12 "Golden Tickets" that are used as a pre-reservation for autographs and relics each month (except for 1/1's). Another perk is a members-only concierge that can clear up any questions you have within 24 hours. Finally, the 2017 Topps Now Baseball Loyalty Program membership bestows to-be-announced VIP status, including gift bag, at a private event, as well as VIP status with Topps at the 2017 National Sports Collectors Convention. 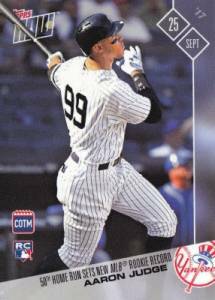 2017 Topps Now Autograph PLATINUM Aaron Judge RC - BGS 10 POP 1 REALLY JUST 1 ! Issued monthly as an incentive for Hall of Fame and Platinum members. All-Stars get one COTM each season. Print runs (PR) noted below as available. Shop specific cards on eBay using the links below. 17 cards. Provided to Platinum members at All-Star Game weekend party. Shop on eBay. 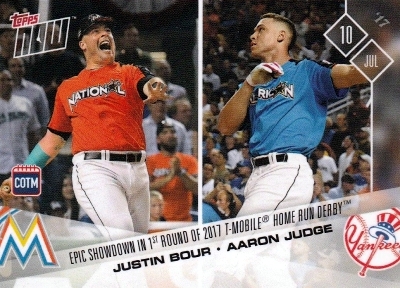 Full set given to Platinum members at the Topps party during All-Star Game weekend. Provided to Platinum members randomly during the season. 9 cards. Serial numbered #/25. Shop on eBay. Full set sent to Platinum members before the season started. I give them a 5. 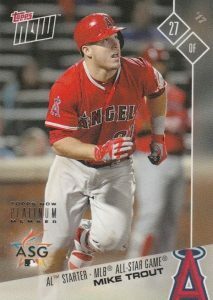 My guess is you must purchase directly from Topps to qualify for these NOW cards, not from secondary market on ebay. You are correct. 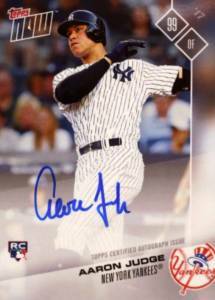 Only purchases made directly with Topps are eligible.